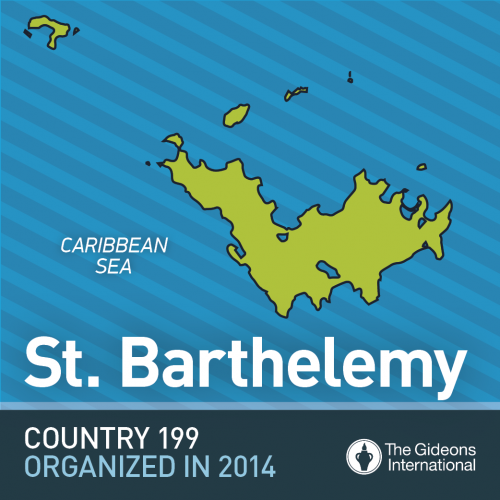 The Gideons International is pleased to announce the opening of Country 199, St. Barthelemy. The country has a population of 9,000. The first camp opened on November 9 with seven Gideons and five Auxiliary. The island country is located in the Northeastern Caribbean Sea and operates under the French constitution. With over 200 luxury hotels and villas and more than 200,000 tourists annually, St. Barthelemy offers many opportunities for placing Scriptures to reach the lost. The annual placement potential is 4,500 Scriptures per year. “We praise God for His faithfulness in continuing to open doors where Gideons and Auxiliary can share copies of God’s Word,” says Craig Warner, Executive Director of The Gideons International. Meet the first Gideons of St. Barthelemy. Please pray the Lord will bless their desires to share His Word and reach men, women, boys, and girls with the hope of Jesus Christ. © 2014 The Gideons International. Please pray for these new Gideons and Auxiliary as they begin to distribute and place God’s Word. Pray also for open doors and open hearts as Scriptures are distributed and the Gospel is shared. We praise God for this tiny island and the opening of the ministry as No. 199. I pray for No. 200 in God’s timing. This is a wonderful answer to pray! My prayers are with this new camp. The island may only have a citizen population of 9,000, BUT (!) 200,000 yearly visitors to the area hotels! WOW! What an opportunity to “Reach the Lost”! Let us keep on praying diligently each day for these “Open Doors for Christ” and for COUNTRY 200!!! Praise our Mighty God… in the Name of our Mighty Savior – Jesus!!! Since I have been receiving mail from the Gideons – this is the very first time that a new country has been mentioned in connections with you!!!! My heart is overjoyed and rejoices with you all to give glory and praise to Jesus!!! Yes! I am in agreement with you, in prayer, to ask the Holy Spirit to reveal Jesus to each heart on St. Barthelemy – after all, let’s not limit our asking for some or most – why not all, in Jesus’ name. Go Gideons in that power that rose Jesus from the dead!! This is great news! 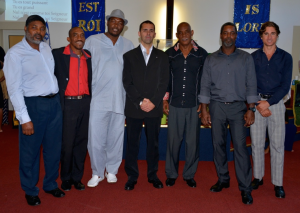 Seven Gideonites and 5 auxiliaries! Great start! Who will be country number 200! Let’s all put our prayers into it and see how the Lord paves the way forward into all the remaining unreached lands on earth! I will share this in my next church presentation tomorrow. God Bless You People and may your tribe increase!! Praise God for this new country! Praise Lord for this new camp! God is good and His glory is wonderful. Thanks God for this opportunity at new country. God contnue bless the ministry of The Gideons International . Praise the Lord. Lord God thank you for the 199th country which opened dor for Ministry. Bless the 7 gideons and 5 auxiliaries. Let the lost come to you by your Word which will be shared by them! Praise GOD! When Christ our LORD was with HIS Disciples (Matt. 24:14) HE told them “And this gospel shall be preached in all the world for a witness unto all nations; and then shall the end come”. We’re getting close HOME!!!!!!!!!!!!!!! !